Being prepared for anything means having an alternate source of backup power available, therefore, knowing what the best portable and standby propane generator on the market is will help get you get power restored in a pinch. Having a back-up power source is always a good idea even if you don't think that you need it now. After all, the entire reason behind getting one is just in case there's an emergency that causes a power outage. Some power outages are caused by technical difficulties on the side of providers, but sometimes it's because of things that are beyond human control. Hurricanes, tornadoes, and other natural calamities can cause outages and having a stable power source to charge your phone and other emergency devices is very important. When I was renting a home in Oklahoma, the power went out suddenly in the night due to a tornado in the area. Fortunately, the owner did have a generator that I was able to use until the power was restored. It made life much easier. Sportsman's GEN7000LP model portable generator is a considerably small generator measuring in at 33 x 19.5 x 24.5 inches. It weighs in at 172 pounds and can power common household appliances. This Sportsman propane generator is quite small and is recommended for camping trips but it is also suitable for running and charging essential electronics and appliances during outages. This is a good choice for those who just want to keep small appliances running. 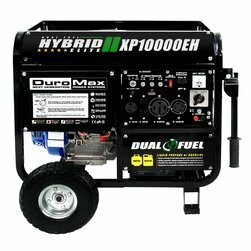 This generator requires a manual start, however installing a motorcycle battery will activate its electric start feature.